Rhapsody on Mount Elizabeth is a luxurious boutique 32-unit development located along Mount Elizabeth in the prestigious District 9 within short walking distance to the popular Orchard Road. Rhapsody on Mount Elizabeth is design along contemporary lines with lush tropical greenery, tree-lined walkways and water features blending seamlessly with the landscape. Rhapsody on Mount Elizabeth epitomizes urban chic with its minimalist architectural design, functional layouts with beautifully proportioned spaces and expansive views of the city. From full-height bay windows to expansive balconies, Rhapsody on Mount Elizabeth is about spectacular views of it's surroundings. Designer finesse and urbanity extend into the bedrooms, with each bedroom imbued with quality finishes, a distinct characteristic of the Rhapsody on Mount Elizabeth. The spacious private retreat of the master suite with L-shaped bay windows and resplendent views of the surroundings adds to the creation of a Masterpiece. At the Rhapsody on Mount Elizabeth, the wide range of facilities leaves even the most pampered spoilt for choice. Unwind at the fully-equipped gym, throw fabulous parties by the pool or enjoy a therapeutic soak in the Jacuzzi amid verdant lush surroundings and melodious tunes of cascading waterfalls created exclusively for your indulgence. Mere minutes from the vibrant eclectic mix of shopping malls and designer boutiques along the Orchard promenade, Rhapsody on Mount Elizabeth is your answer to cosmopolitan lifestyle in a sanctuary with the city. 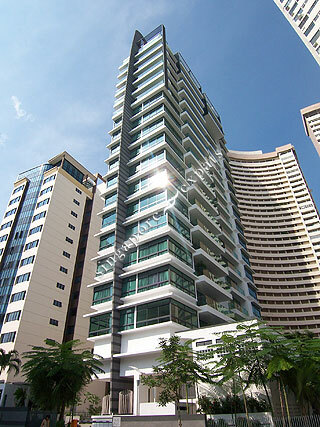 Minutes by foot to Orchard Road, Rhapsody on Mount Elizabeth is situated in the heart of Singapore's shopping belt. Education institutes like Singapore Management University (SMU), International Singapore School (ISS), Overseas Family School, Chatsworth International School and Anglo Chinese Junior School are also in the vicinity. Rhapsody on Mount Elizabeth is accessible via the nearby Central Expressway (CTE). Orchard MRT station is also a stone's throw from Rhapsody on Mount Elizabeth and other public transport is readily available along Orchard Road.